Q: Our master bathroom is reasonably large, but it always seems cramped and uninviting. What can we do to make it roomier? 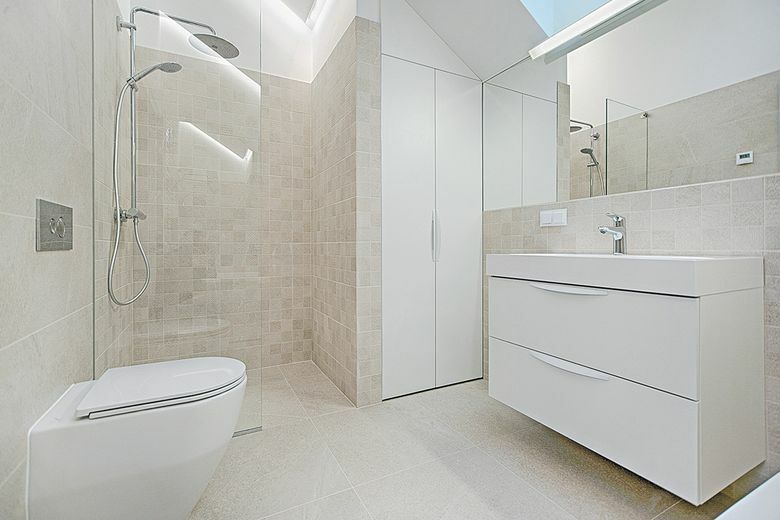 A: There are few things as pleasing as walking into a bright and spacious bathroom. But bathrooms are notoriously tricky spaces; there’s a lot going on in a very small piece of real estate. Fortunately, there are some nifty tricks you can use to make your bathroom feel bigger without moving walls. Some of these tips will create actual space while others will make your bathroom seem more spacious. A shower curtain steals space because it’s effectively an extra wall in your bathroom. By replacing it with frameless glass, you can reclaim it. Take the glass as high as you can afford to go. The clear glass will act as a mirror, reflecting light back into the bathroom. Chances are that you don’t even use your bathtub as a bathtub. Replacing it with a walk-in shower will dramatically increase your floor space. Just make sure to keep the floor finish uniform throughout the bathroom and cut out the shower curb if you have the option. Whatever tiles you choose for your shower should well match the rest of the floor. A little trick that creates more space in a bathroom — and in any room — is lifting the furniture off the floor. A floating vanity opens the floor space beneath it. The same goes for any other storage unit, like linen cupboards with legs for example. The floor will extend to the walls instead of ending at the furniture, and it will feel more spacious. A cluttered room feels small. To make your bathroom feel larger, keep as much stuff as possible out of sight. Maximize the storage space under the sink with pull-out shelves and organizers. Keep everyday items around the sinks and bathtub — if you don’t replace it with a walk-in shower — in containers for easy access. The No. 1 trick for creating the sense of space in a room is to make its walls appear farther away. An non-uniform wall — contrasting halves of tile and paint, for example — draws our attention and seems closer than it is. To make it recede, keep it uniform. Mia Hannom is the owner of In Form Design, a member of the Master Builders Association of King and Snohomish Counties (MBAKS). If you have a home improvement, remodeling or residential homebuilding question you’d like answered by one of the MBAKS’s nearly 2,900 members, write to homework@mbaks.com.